GUN METAL POLI DEPORT INOX/GUN METAL MACHINE POLISHED FACE STAINLESS STEEL LIP. 4 X SUPERBE JANTES NEUVES/. 4 X BRAND NEW WHEELS. 9,5 X 22 ET40. MERCI DE NOUS CONTACTER POUR CONFIRMER QUE LES JANTES SONT COMPATIBLES AVEC VOTRE VEHICULE. CES JANTES SONT EN STOCK/WHEELS ARE IN STOCK. RANGE ROVER LG, LM, LS SPORT, DISCOVERY (LA). AMAROK, TOUAREG 2.5 TDI 5X120. TYPE DE JANT E S/WHEEL TYPE. GUN METAL POLI BORD INOX. GUN METAL MACHINE POLISHED FACE STAINLESS STEEL LIP. DIMENSIONS DES JANTES WHEEL DIMENSIONS. DELAIS- 1 à 4 JOURS OUVRABLES. 50 EUROS POUR LA CORSE. POUR DOM TOM CONTACTEZ NOUS. AUTOJANTES EST FOURNISSEUR D'UN GRAND NOMBRES DE MARQUES DE JANTES ALUMINIUM ET DE PNEUS DE HAUT STANDARD DE QUALITE POUR TOUS TYPES D'AUTOMOBILES AINSI QUE D'ACCESSOIRES POUR LES ROUES TELS QUE ECROUS ANTIVOL, VALVES INVISBLE ETC ETC. NOUS SOMMES L'IMPORTATEUR EN EUROPE POUR VERTINI WHEELS. 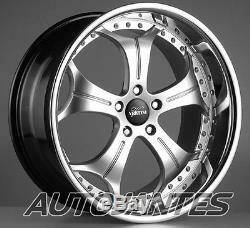 ARE AN ALLOY WHEEL COMPANY. WE ARE EUROPEAN IMPORTERS FOR VERTINI WHEELS, STANCE WHEELS & AVANT GARDE WHEELS WITH THE LARGEST SELECTION OF THEIR WHEELS AVAILABLE IN EUROPE. V ERTINI WHEELS were born from an obsession to create styling wheels by deploying craftsmanship and technology to the highest standard and settling for nothing less than absolute perfection. Thus, Vertini wheels embody the finest elements that luxury wheels can possess. These qualities seem fitting for the individual who has a strong preference for full size German and Japanese luxury sedans and wanting more than just another mass production vehicle. Vertini wheels offer more exclusive individual styling, more exciting and brave design, to stand out from the crowd and be noticed. V ERTINI WHEELS are designed specifically for your marque and manufactured in accordance with factory tolerances and specifications. Our tight scrutinization assures to provide proper offsets, brake caliper clearance and vibration-free ride for your BMW, Mercedes-Benz, Lexus, or Porsche. AUTRES MODELES DISPONIBLES DE VERTINI, AVANT GARDE, STANCE & VMR. OTHER VERTINI, AVANT GARDE, STANCE & VMR MODELS AVAILABLE. VERTINI MAGIC INOX CONCAVE, BLACK MACHINED, SILVER MACHINED, BLACK. VERTINI MONACO INOX CONCAVE BLACK MACHINED, SILVER MACHINED, BLACK. STANCE SC-5IVE INOX CONCAVE, SILVER MACHINED, BLACK, BLACK MACHINED. STANCE SC-6ix CONCAVE, SLATE GREY, BLACK MACHINED, SILVER MACHINED. VERTINI CARRERA INOX VERTINI HENNESSEY INOX VERTINI SAVARI INOX. VERTINI REGENCY INOX VERTINI FASHION INOX VERTINI FAIRLADY INOX. VERTINI DYNASTY SILVER MACHINED, GUNMETAL, GUNMETAL MACHINED. VERTINI MILANO INOX, SILVER MACHINED, BLACK, BLACK MACHINED. VERTINI SICILIAN INOX, RIVIERA INOX HYPESILVER, RIVIERA INOX BLACK MACHINED. VERTINI DRIFT INOX, GOLD, BLACK, BLACK CHROME INOX. AVANT GARDE M310, M550, M359, M510. L'outil de mise en vente gratuit. Mettez vos objets en vente rapidement et en toute simplicité, et gérez vos annonces en cours. L'item "JANTES ALU 22 POUCES VERTINI REGENCY WHEELS DEPORT INOX LAND ROVER DISCOVERY" est en vente depuis le lundi 26 novembre 2018. Il est dans la catégorie "Auto, moto pièces, accessoires\Auto\ pneus, jantes\Jantes". Le vendeur est "autojantes" et est localisé à/en Bignan. Cet article peut être expédié au pays suivant: Europe.